Friday prayer service, 1:00-2:00 p.m., community prayer begins at 1:50 p.m.
Sunday school, 10:30 a.m.-1:15 p.m., three 45-minute sessions plus a break. Sunday Zuhr prayer, 1:30 p.m.
Eid-al-Fitr (festival of fast-breaking) at the end of the month of Ramadan (November 25, 2003). Eid-al-Adha (festival of sacrifice) on the tenth day of the Islamic month Dhul-Hijjah, the last month of the Islamic calendar (February 12, 2003). The Islamic Society of Greater Harrisburg (ISGH) was founded in the early 1970s. Its first meetings were held in the basements of community members’ homes. 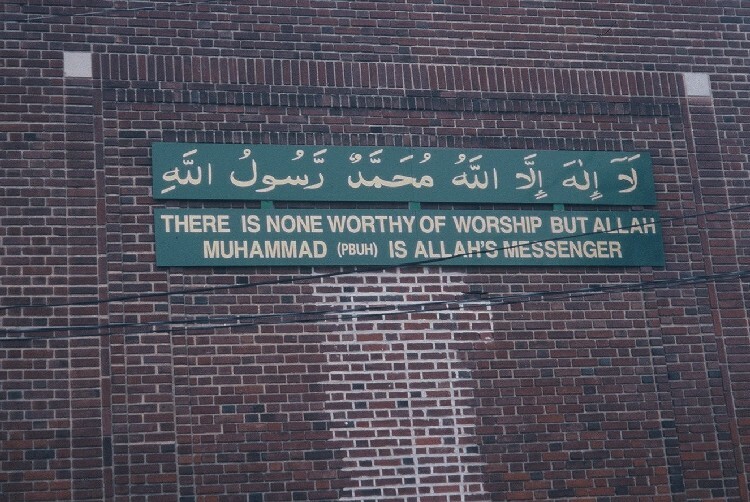 The first building of the ISGH, behind the Harrisburg East Mall, was a Christian Sunday school which the ISGH purchased and converted into a mosque. 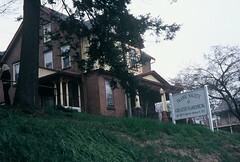 ISGH was in this location through the 1970s and into the 1980s. During the 1980s, more people came to the USA from the Middle East and South Asia. Shortly after its founding, the ISGH community experienced a cultural divide between the immigrants from India and Pakistan, and those from the Middle East. The Arab Muslims formed a separate community called the Masjid-as-Sabereen (Mosque of the patient/peaceful ones). The Indo-Pakistani Muslims continued as the ISGH community. After more than ten years behind the Harrisburg East Mall, ISGH moved into a Catholic church complex on North Front Street in Steelton. The Catholic Diocese in the area sold the property to ISGH, despite the fact that its bid was low, so that the facility would continue as a place of worship. The church replaced the stained-glass windows of the stations of the Cross with stained glass panels of some of the ninety-nine names of God in Arabic. The ISGH community converted the bathrooms to include wudu stations, and refurbished the main sanctuary to align prayer in the direction of Mecca. The Muslim community of Harrisburg has continued to grow and diversify, with additional mosques reflecting patterns of ethnic diversity within the community: African American, Indian/Pakistani, Arab, Bosnian, and Vietnamese. Contact information on these additional mosques is available online: Institute for Cultural Partnerships. Worshippers at ISGH include American citizens and immigrants from India, Pakistan, Bangladesh, Sri Lanka and Africa. It is principally a community of immigrants and their American-born children, as well as a small number of Caucasian and African American converts. Languages include: Hindi, Arabic, English, Spanish, and other Indian sub-continent languages. Adult community members range in age from their mid-thirties through late sixties. There is a moderate presence of young adults in their late teens through early thirties, many of whom are in college at Penn State or elsewhere. Children make up a sizable part of the community, ranging in age from infants through eighteen, with the largest concentration of children in their elementary and early middle school years. Young families make-up a large part of the ISGH community. The center is a converted Catholic Church complex. The large prayer room, formerly the church sanctuary, is in the main building of the complex. In this same building there is a smaller prayer room, one eighth the size of the larger prayer room, and wudu stations. Attached to the main building is a two floor Sunday school. On the main floor is the ISGH office, one classroom, public bathrooms equipped for wudu for men and women, and the Musallah – a gathering and prayer room for women. Some steps down from the main level at the end of the main hallway is a gymnasium with a stage and small kitchen equipped with refrigerator, stove, and food preparation area. The gymnasium is used by the Sunday school for lunch, group activities and presentations, and also by the ISGH community for special functions and events. The second floor has four Sunday school classrooms that range in sizes. Each classroom is equipped with chalkboards, a teacher’s desk, and either individual desks, long tables, or a combination of both. Separate and adjacent to the main building, and attached Sunday school, is a housing facility, formerly used to house the clergy and nuns of the Catholic Church. This building houses community members having financial difficulties. It also has a small library. There is a small parking lot that sits in the between the separate buildings that has room for about 12-15 cars. 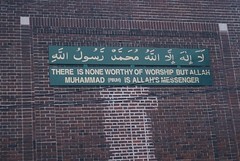 Other parking is available on the streets surrounding the Mosque. The main floor is flat, open, and wide; the front third of the room rises in wide platform-like steps. It is here that the men of the congregation gather for communal prayer on a typical Friday. During prayer, the men line up shoulder to shoulder along the alternating light and dark greek stripes in the carpeting. The final raised platform extends into a niche in the front wall where a podium and throne-like, covered chair sit. A male member of the community gives a sermon from the podium on Fridays and the Imam leads prayer from this niche. The community faces the niche for prayer, otherwise they may scatter around the room, some sitting up against walls and others not in line with the carpet lines. There is a door in the front of the mosque, to the left facing the niche, that leads either down a hallway to the smaller prayer room, or up the stairs to the Sunday School complex. Friday Community Prayer, Salat-al-Jumma (every Friday), including a Sermon and possible reading from the Qur’an.